In the late 1940s, the Algoma Central Railway’s car shops rebuilt 250 old 40′ flatcars into gondolas by fabricating new bodies on existing underframes. This fleet comprised two unique series: AC 4601-4803, 203 cars with 39’5″ inside length rebuilt from late 1946 to late 1947; and AC 4804-4850, 47 cars with 40’10” inside length rebuilt in mid-1948. 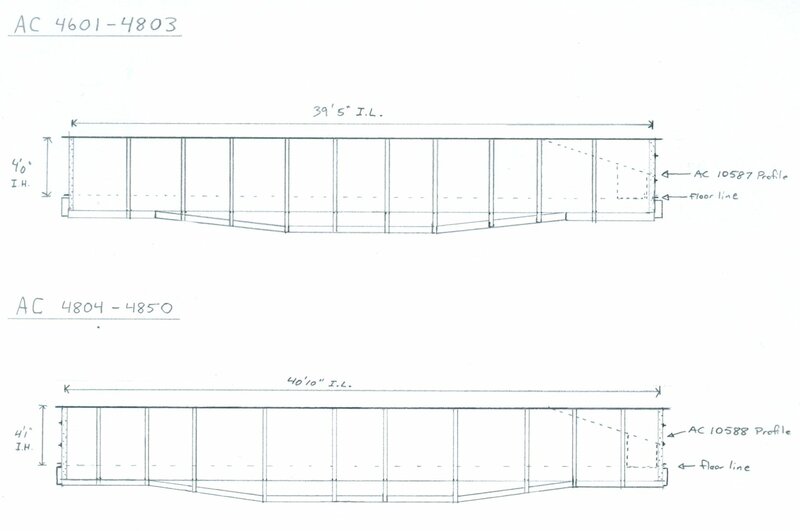 In addition to the extra one foot of length, the latter cars can be visually identified from the former by a different spacing of the side ribs. These cars lasted in revenue service into the 1970s by which time most of them were retired, but several cars remained in work service for a longer time. 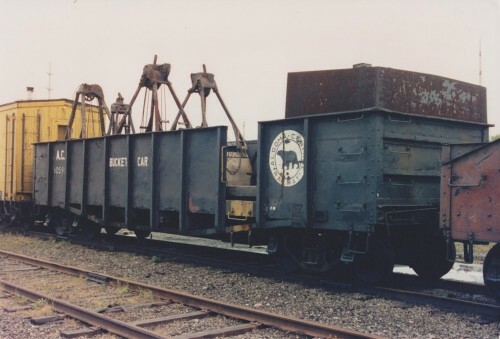 AC 10591, ex-4601-4803 series gondola in work service as a bucket car for the railway’s diesel host in the early 1990s. Photo courtesy Blair Smith. As “new”, the cars were painted in a simple black scheme with what is probably the first usage of the black bear logo on freight cars. The logo was ringed in red, and a partial example of a 4601-4803 series car in original paint can be seen on the left edge of this 1956 photo. (Another 350 brand-new 48’6″ gondolas were also acquired in September 1947 from National Steel Car in the AC 3501-3850 series, and also painted this way when new.) 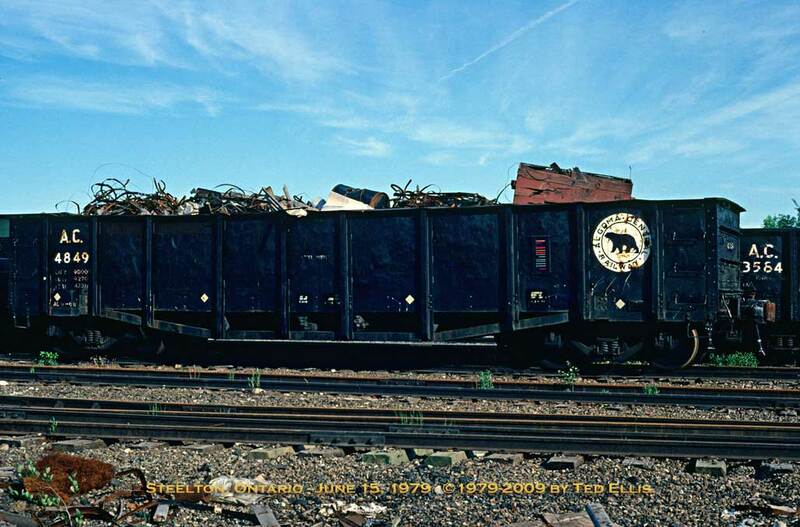 Meanwhile, this 1979 photo of AC 4849 shows the paint scheme they wore in the 1960s-1970s. Obviously such a strikingly unique car with those open fish-belly side sill reinforcements is just begging to be modeled, and this home-built car is just the thing to help capture the character of the railway. To that end, I’ve used known overall dimensions from ORER listings (thanks to Railwire user “Kisatchie” for looking up some numbers for me as my oldest copy is from 1975 which no longer includes either of these series) and photographs to try to work out some sketches and a “reasonably close” scale drawing. 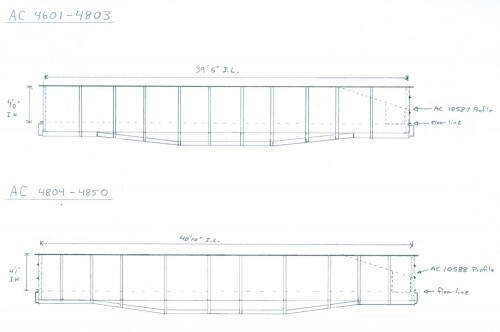 Side elevation drawings comparing AC 4601-4803 and 4804-4850 series gondolas. Over the last couple of weeks I’ve been slowly working on a pair of these cars – one each of each type. Both will become support cars for my diesel crane: bucket car 10591 (ex-4601-4803) and boom car 10588 (ex-4804-4850). 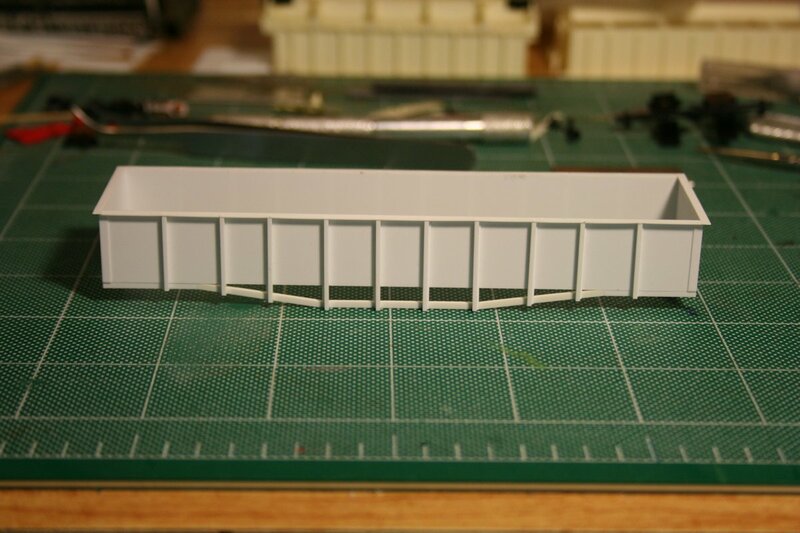 In progress model of 4601-4803 series car. The sides are .020″ styrene, with side posts consisting of a .040x.040″ strip on a .010x.060″ bottom flange – although it appears the ribs on the prototype car are actually a Z-angle. The drop side sill is .040x.060″ strip and the top chord is .010x.080″ strip. Stay tuned for more progress on what should be a very unique pair of cars. This entry was posted in AC 4601-4850 40' Gondolas, Cranes and Support Cars and tagged AC 4601-4803, AC 4804-4850, Bucket Car, Drawings, Gondola, Model, MOW, Scratchbuild by Chris van der Heide. Bookmark the permalink. Glad to see someone putting these old photos to use, it’s exactly why I took them, it seems like eons ago. Take care!